Black and white has always reigned supreme as the base fashion colors and it happens to be one of my favorite combinations, but between the boldness of black and the purity of white lies gray, a mixture of the two. 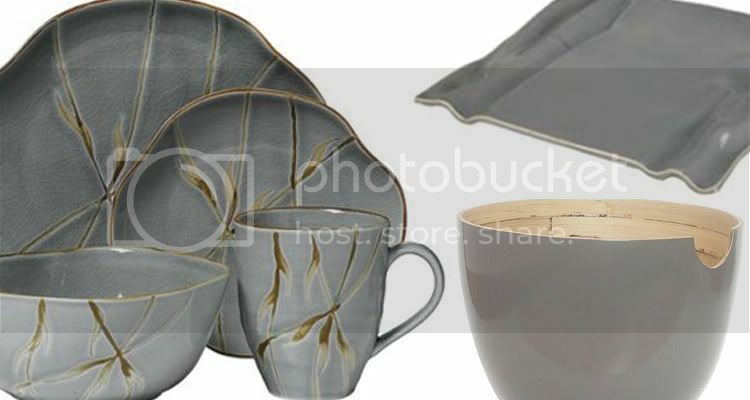 (shown above: Ribbon tablemats, Chilewich; Coupe Collection, french grey, from $25.75, Heath Cermanics). Grey is the new black - - - move over black the slightly muted counterpart is stealing the show! The popularity of gray is on the rise, fashion loves grey this autumn and now this sophisticated catwalk color is slipping effortlessly onto the table. From charcoal to heather you can find this color on plates, vases, glasses and textured tableware items. 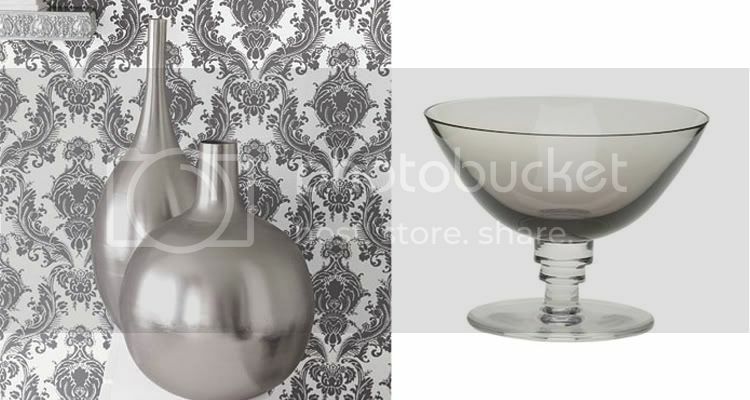 (Shown above: Brushed metal vases,$129.00, Brocade Home; Continential water goblet, $210.00, Michael C. Fina). 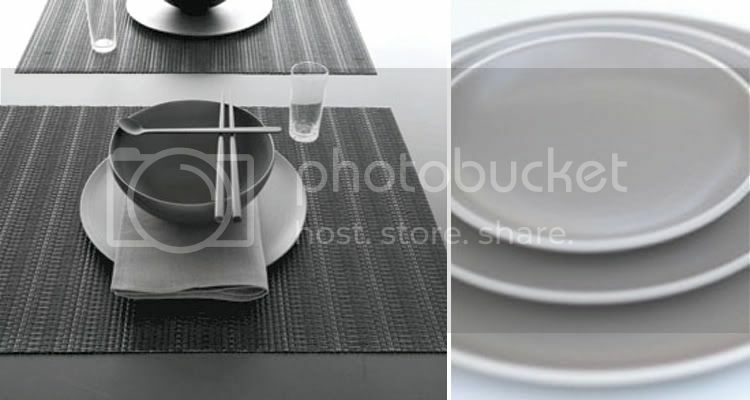 (above: Ceramic plate, gravure grey, $63.00, Jars, Michael C. Fina; iittala grey aalto vase, $33.00, Finn Style). Very pale grey is softer and can be more interesting than white. Start with grey placemats they make a great base to your table, and draws attention to any other piece that you want to show off. 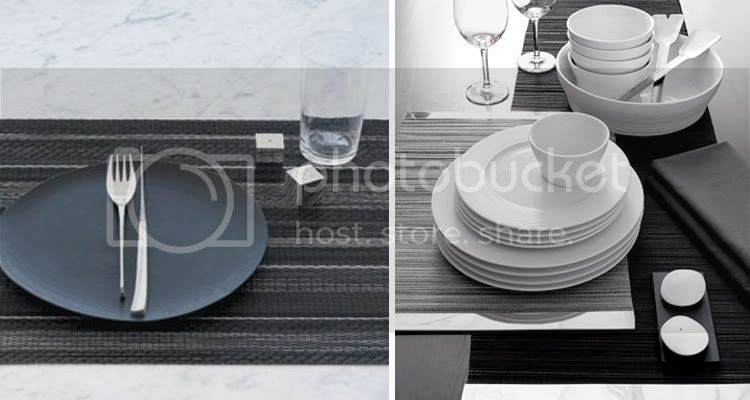 (above: mixed stripe tablemat, Chilewich; grey placemat, $8.95, Cb2). I love the grey look with metallics - especially silver and bronze. For sharp chic, add a touch of shiny glass and silver metals such as chrome, steel or aluminum. Use lots of different greys, layering them throughout a room, adding splashes of contrast to get a good color balance. 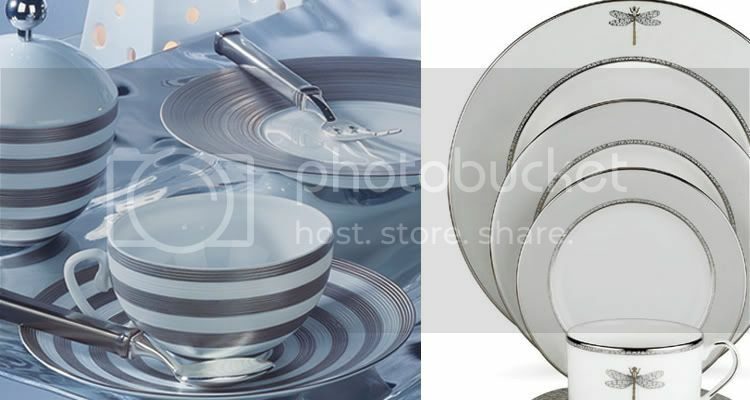 (above: Hemisphere dinner service, JL Coquet, from $113.38, Artedona; Kate Spade, June Lane, from $38.00, Michael C. Fina; Spirit 16pc dinnerware set, $74.99, Target; ripple plate, Alex Marshall Studio; Globo Salad Bowl, Smoke, $99.00, Lekker). Thing is, grey is actually a practical and flattering color. Like black and white, it is more of a statement than a color. I would argue that it is not boring; it is neutral and makes for a great alternative to plain o' white when registering for dinnerware. Wow to the Zara Home collection! Definitely a chic take on the organic movement. 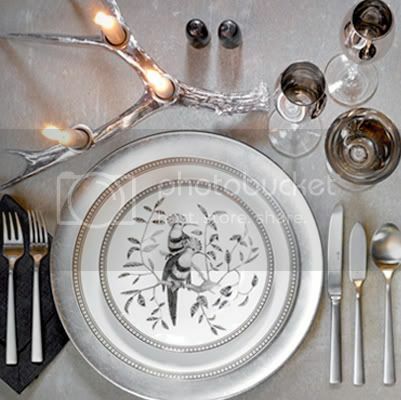 The twig candle holder and the side plates with the birds look amazing. The more I see of Zara Home the more I anticipate their arrival to the States! They've beautifully combined these two trends in their Autumn/Winter collection - - - grey and organic. I can't wait to see more from them. I love the Ceramic plate and the Hemisphere dinner service and of course Kate Spade. Great post. Since everyone is talking about Gray/Grey :) and showing such lovely things. I'm starting to love the color more and more. Sarah, thanks you for sharing your views on Fall trends with my readers. Black and white are a favorite - and now grey! I love the brushed metal vases. Natasha, remember when we were all about "yellow" this spring? Well, gray is the "it" color for the fall and I couldn't be happier. I love it! 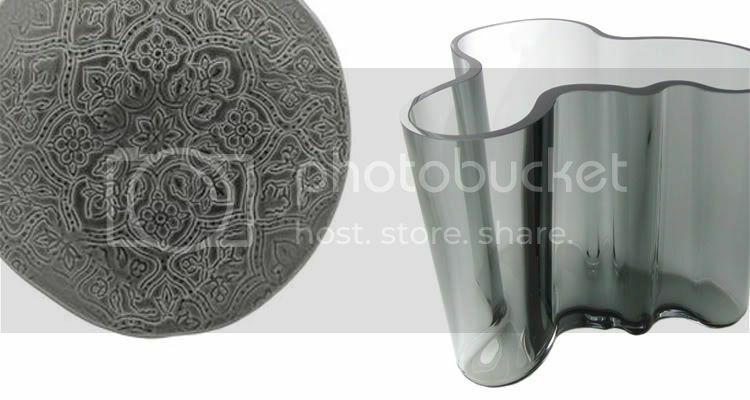 Erin, the brushed metal vases from Brocade Home are my favorite. I wish they had a store, I want to see them in person!! !